products do NOT contain DEHP. 100% smooth fire polished eyelets on all sizes and styles. Cure Medical does not manufacture rough cold punched eyelets. All products always have eyelets with smooth rounded drain holes. 100% latex free on all sizes and all styles. Latex allergies can change your life forever, so Cure Medical does not ever offer latex products. Cure Medical also donates 10% of their pretax profit to medical research in pursuit of a cure for spinal cord injuries and central nervous system disorders. Simply by using Cure Medical products, you support advances in medical science. Cure Medical catheters come in intermittent straight catheters for men, women and pediatrics along with closed system catheter kits. Coudé tip catheters are also available. 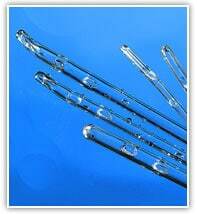 View Cure Medical catheters available and additional information about the products. If you are interested in learning more about Cure Medical catheters, contact us. We will be happy to discuss more information regarding any of the intermittent catheter supplies we carry, which includes an incredibly wide variety of popular catheter brands and all types of catheters. Curious what all those symbols and numbers on your catheters are about? Get the scoop here.